CivilizationPhoenician, 1200 B.C.E. - 800 B.C.E. 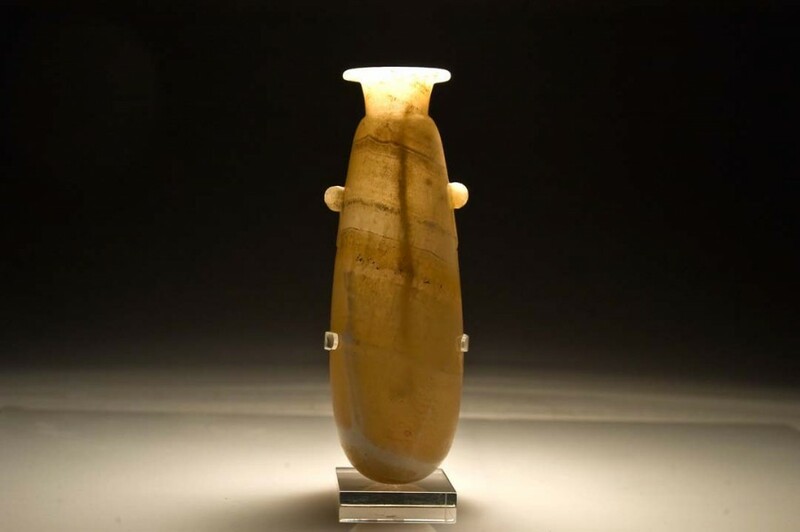 This highly polished and well-finished amphoriform alabaster vessel is a superb example of one of the world’s first international art forms, traded around the Mediterranean in the height of the Phoenician supremacy in the 2nd millennium B.C.E.. It has a generally Egyptian form and finish, a round-based amphoriform shape tapering towards the neck, with a constricted band at the shoulders flaring to a wide, flat-lipped rim. The upper third is decorated with a pair of small lug handles which would have served a more decorative than practical function. The sculptor has exploited the bedding planes in the stone so that the brownish-yellow banding, highlighted with dark and white lines run diagonally across the piece. 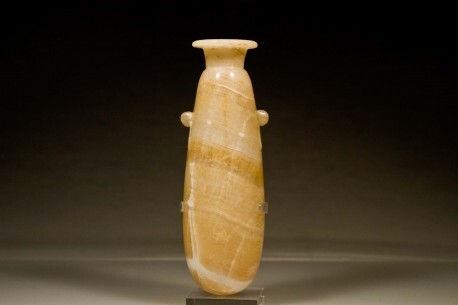 The function of the piece is uncertain – although a container for expensive unguents seems likely – but what it more significant is the size of the object. The Phoenicians’ trading practices focused primarily in high value, small items that were traded to ruling elites across the Mediterranean in the Bronze to Iron ages. Their networks were primarily eastern Mediterranean – they were ethnically based in the area around Tyre, Lebanon and coastal Canaan – especially Egypt, Canaan, Crete, Cyprus and Greece. However, their interests then expanded far beyond this region, beyond the ‘Pillars of Hercules’ (Straits of Gibraltar), the western European coast, the Canary Islands, and as far down to Carthage and up as far as Cornwall in SW England, the only reliable source of the tin so necessary to the bronze smelting process. Most of these areas had very distinctive artistic traditions, such as the Minoans or the Cypriots, but the items the Phoenicians traded were more ‘international’ – decorative, ornate and polished. Many, such as this, were inspired by Egyptian designs, which were viewed as especially luxurious and aspirational to the emerging societies of the region. 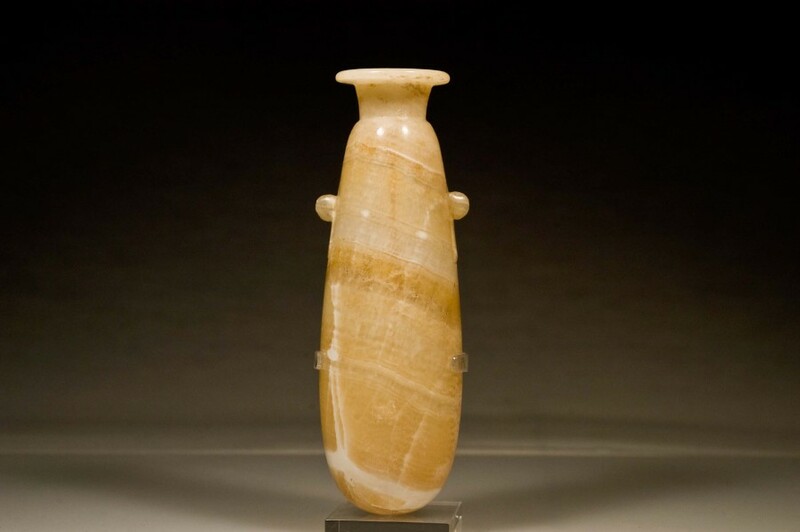 Others, particularly glassware, were made by the Phoenicians themselves, specifically for international trade. The gubernatorial and aristocratic elites of the circum-Mediterranean region were, in this sense, much more homogenous than the people over whom they ruled, and the Phoenicians were prime movers in the evolution of this first globalised society. This is a rare and exceptional piece of ancient art.